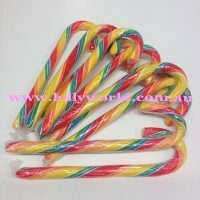 Rainbow Candy Cane in colour and also a tutti fruity taste. For something a little different to the usual minty candy cane try the rainbow. A little bigger at 28g this product comes in a pack of 10.